I used to work for a big, huge wireless company. I was the nameless, faceless guy who received email requests all day and made minor change to wireless accounts. Each email was formatted exactly the same way and I used the same system for each change. 8 hours a day, 5 days a week I was a machine. In layman’s terms, when you iterate or use an iterative process, you’re doing the best you can with the information you have, checking how successful you were, and using that information to take another, more educated stab at it. Since I’m a self-taught designer and developer, iteration has been a critical part of my professional growth. I’ve developed a very iterative mindset. An iterative mindset is based on three things: observation, analysis, and persistence. In other words, iteration comes more from desire and hard work than any kind of innate ability. 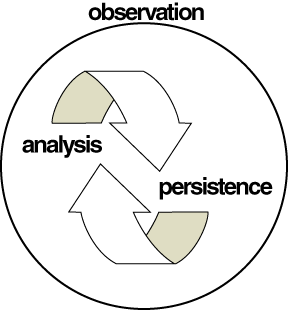 To successfully employ iteration, you need to be observant. What you’re looking for are problems, specifically recurring ones. These can range from minor annoyances right up to massive failures. You’re also looking for benefits. This could be something that saves you 10 seconds a day or something that saves you $100 a day. The best way to be observant (and to benefit from what you see) is to record. I record things in a simple text editor and write them up later to post on my blog. I also record very minor things in a lined notebook that I carry around with me. A lot of what I type or write down does not get used, explicitly. By recording it, however, I made a mental underline, one that can occur to me later if I’m confronting the same problem. This is begging for a real-life example. Let’s say your having a conversation with someone. If this person is someone you want to please (your significant other, a potential client, a potential date), you probably want to be tuned into them and observant of how they react. If you talk poorly about our current president (a potentially risky topic with any of the people referenced above), you’ll want to judge their reaction to see if you shold do that again. Now, extend that to everything and everyone around you. You want to have pleasant, recurring interactions with all that surrounds you and the first step towards that is being observant. I find this word particularly unfriendly at times because it implies a lot of work. Analysis, here, just means being observant in way that finds connections between what you’re observing. Intention – to connect seemingly disconected elements, you have to let go and make this your intention. Analysis is self fulfilling: if you’re certain there are no connections or you are unable to find them, that will become true. Patience – I think this is the true talent of what might appear to be a gifted analyst. In theory, if you had enough time to draw a proverbial line between all possibilities you would find the connection (or be certain there was no connection). Using the previous example of a conversation, now consider taking the next step beyond your observation and try understand what you’re seeing. The easiest thing you can assume about someone reacting poorly to speaking poorly about the current president is that they are a democrat. As likely as this could be, there might be other factors at work here. They could be a strong republican and patriot discouraged by those who don’t support the powers that be. They could be apolitical and assume that you’re being racist. They could be just generally uninterested in politics and bored of hearing about it. Your analysis consists of coming up with many possible solutions and, using your observations, making a guess at the right one. Here’s where the actual work comes in. To be iterative, you need to repeat the process using your new information honed by your analysis. You must be willing to face the same problems with new information and risk potential (repeat) failure. Persistence is direct reflection of how much you want to succeed. It has less to do with innate ability or the size of the reward. I’ve seen people tenaciously playing a video game for months on end towards a goal that few people understand. I’ve also seen people lose seemingly important things in their life through inaction. People will cause a scene over a few pennies but will drop out of high school for no discernable reason. Hence, persistence is a mindset. Sticking with the observation and analysis necessary to make better decisions about previously faced problems is not always easy but if you see each attempt as an experiment and part of a larger process instead of individual failed events, you’ll be better prepared to face the next iteration. My conversation example needs a bit of modification to work here. We’re going to assume the person you’re talking to does not have any inclination to give up and walk away. With that in mind, you’re now free to iterate towards a better experience with them. If your goal is to find a healthy middle ground, maybe you try a topic that isn’t so inflammatory. Maybe you ask them questions. Maybe you compliment them on a particular attribute. However you do it, you’re experimenting towards your goal, watching and learning along the way. This topic came to me as I was combing through my obsessive-appearing series of folders holding various re-useable website templates, code snippets, and documents. Each time I create a new website, I add something new to this library. Maybe it’s a link saved on Delicious, maybe it’s a better site header, maybe it’s a new module I can use in WordPress – could be anything. What I’m always looking to do (in order of importance). I do that through iteration: observing things that cost me time, money, and patience; figuring out how I can cut down on these things as much as possible; and never giving up on improving what I do. What say you? Do you explicitly or implicitly use iteration? How?